Dear BBG: Take note of the Radiogram! The BBG has spearheaded ‘Radiogram’ (voaradiogram.net), an entirely novel form of international high-frequency broadcasting. Radiogram is soundly premised on modern digital techniques and mitigates longstanding impediments to HF transmission. 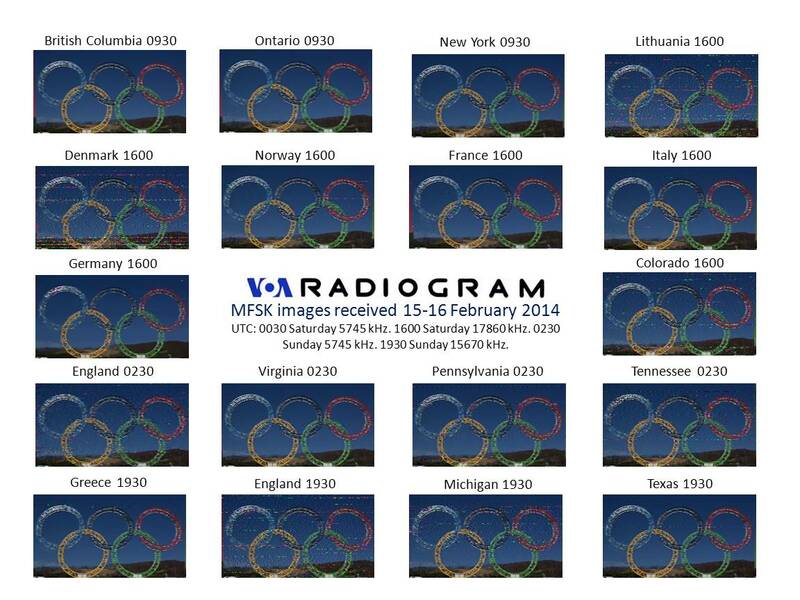 Users around the world have documented reception of fifty VOA Radiogram programs in more than a thousand YouTube videos. BBG must not allow its own pioneering developments to wither, but should advance them toward operational status. Radiogram should not be confused with Digital Radio Mondiale (DRM), which employs digital modulation for sound broadcasting. Radiogram broadcasts web content via robust, interference-resistant, error-detecting/correcting AM tone modulation, using standardized formats widely practiced in the Amateur Radio Service. The user’s ordinary shortwave receiver, tuned to a Radiogram transmission, feeds its audio to a user device. These could include mobile phones, tablets, laptop and desktop computers and the new ARM-based miniature computers and embedded devices. The user device decodes the tones and displays text and imagery despite propagation impairments and intentional interference — and without Internet connection. Placing the radio near the phone or computer is normally sufficient. No hardwire connection is required. By adding a simple audio cable between receiver and user device, however, reception can be silent and covert. No specialized hardware is needed, and the software platform for decoding is long in the public domain. A more advanced, yet still inexpensive setup would use existing “dongle” technology that places a software-defined radio (SDR) inside a small USB enclosure. Such units are available today for a few tens of dollars and widely used by experimenters. The operating system and decoding software could also be incorporated into the device, which could boot the computer, eliminating the need to install any PC software. The user need not be present at the time of transmission to receive content. He essentially receives a web magazine updated at will and always ready for use. The user can redistribute it by printing, USB storage, SMS, E-mail etc. Naturally, the audio tone transmission can be recorded for later playback. Even when buried well under music or noise, the nearly inaudible recorded broadcast can nevertheless deliver 100% copy upon decode. Radiogram’s transmission methods provide text at 120 WPM (near to the speed of spoken English) along with images. Additional languages have been proven, including non-Roman alphabets. Sent over regular broadcast transmitters (no modifications needed), this approach effectively extends the reach of the transmitter. In other words, the digital text mode will decode in locations where the audible speech over the same transmitter would be too low for aural intelligibility. The audio recorded or captured could be replayed over another transmitter to even further extend the reach of the broadcast. 1. Capitalize on Radiogram as a circumvention tool, readily consumable by mobile devices. It should integrate Radiogram into its media strategy and networks. 2. Retain, but reconfigure as necessary its HF facilities in view of the potentially lower costs and greater efficiency of Radiogram when compared to conventional sound broadcasting. 3. Support the development and wide distribution of simple, usable, open-source Radiogram decoding applications for popular mobile devices and platforms (Android, iOS, Windows, Mac, Linux), derived from the free Fldigi software used worldwide. Bennett Z. Kobb, M.S., SMIEEE, is the communications director for an Arlington, Virginia trade association. Christopher Rumbaugh, MLS, is a library manager and web publisher in Salem, Oregon. The views expressed herein are the authors’ own. Again, many thanks to Benn and Chris for submitting such an articulate letter to the BBG and for sharing with SWLing Post readers. If you would like to decode a VOA Radiogram yourself, simply visit VOAradiogram.net for details on broadcasts targeting your part of the world. This entry was posted in Broadcasters, Digital Modes, International Broadcasting, News, Shortwave Radio, What's On Shortwave and tagged BBG, Benn Kobb, Broadcasting Board of Governors, Chris Rumbaugh, Kim Elliott, Radiogram, VOA, VOA Radiogram, Voice of America on March 21, 2014 by Thomas.